In September, Mayor Sly James announced a new Major League Baseball Urban Youth Academy for the 18th and Vine District. The proposed baseball park will be built in two stages at Parade Park. Fundraising for the first phase of the project, which includes new baseball diamonds, youth fields and a walking trail for Parade Park, is already complete. The tax credits will help pay for the second phase, an indoor sports facility. The city is partnering with Major League Baseball and the Royals to build the park. It will be the seventh such academy in the country. With Kansas City revved on Royals post-season play, a city council committee laid the groundwork for phase two of the development of the planned Major League Baseball Urban Youth Academy in Parade Park near 18th and Vine. Mayor Sly James announced the $14 million baseball project in late September, explaining that funding for phase one was in place. The Royals and, Major League Baseball had committed $2 million and the MLB Players Association another $1 million. The state of Missouri and the city were to combine resources to match those contributions. 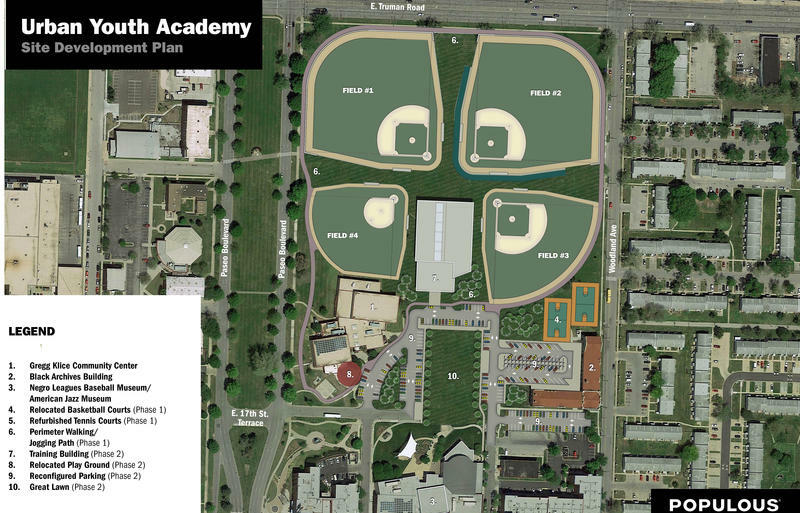 Parade Park in Kansas City’s 18th and Vine District will soon be the home of Major League Baseball’s newest Urban Youth Academy. Kansas City Mayor Sly James announced Friday fundraising for the first phase of the project – which will include two full-size baseball diamonds, two youth fields, a walking trail, a playground, park upgrades and, ultimately, an indoor training facility – is complete. The outdoor fields are slated to open next fall. Revitalizing the historic jazz district and former site of Municipal Stadium has long been one of James' goals.